Whenever I order an omelet out at a restaurant my go to is a spinach and feta omelet. It is a classic and one of my all time favorites. 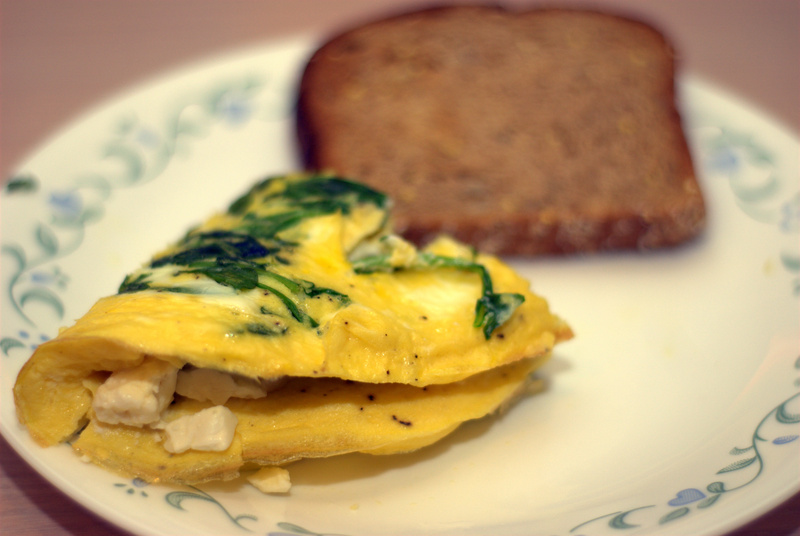 One day I had a hankering for this omelet when I was at home, but did not have spinach. I did have arugula. I thought why not? Luckily my experiment came out great! I may actually like this version better. Arugula has a spice to it that I love. It wilts just as easily as spinach and is a nice compliment to the salty feta. When ordering eggs at a diner they are often made with three whole eggs and cooked in a lot of oil and butter. Yes, it is delicious, but not the most healthy for you. When you make eggs at home you can control the amount of fat and salt you use so you can feel better about eating them more often. I also always try to use one whole egg and one egg white per serving to cut down on the fat and cholesterol without sacrificing taste, color or texture. This recipe can easily be halved to make it for one or doubled and tripled to make it for a crowd. Heat the olive oil in an 8 inch skillet over medium heat. 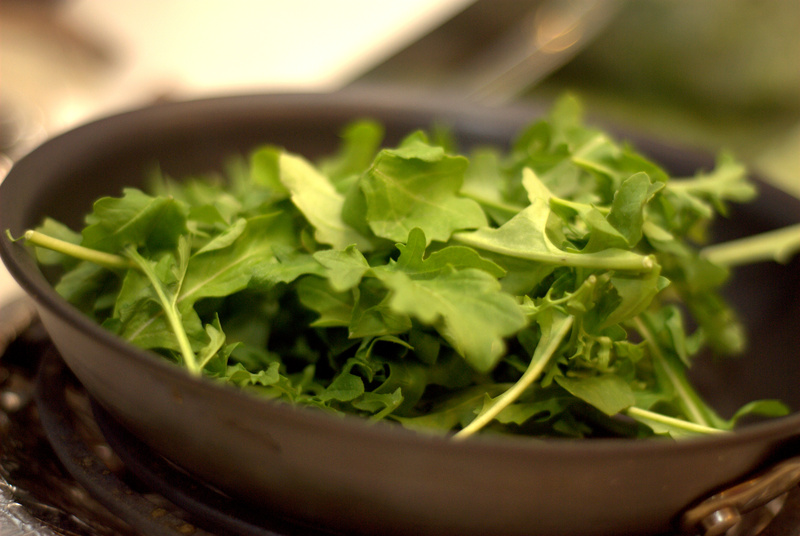 Place the arugula into the pan with a pinch of salt and sauté while it wilts. 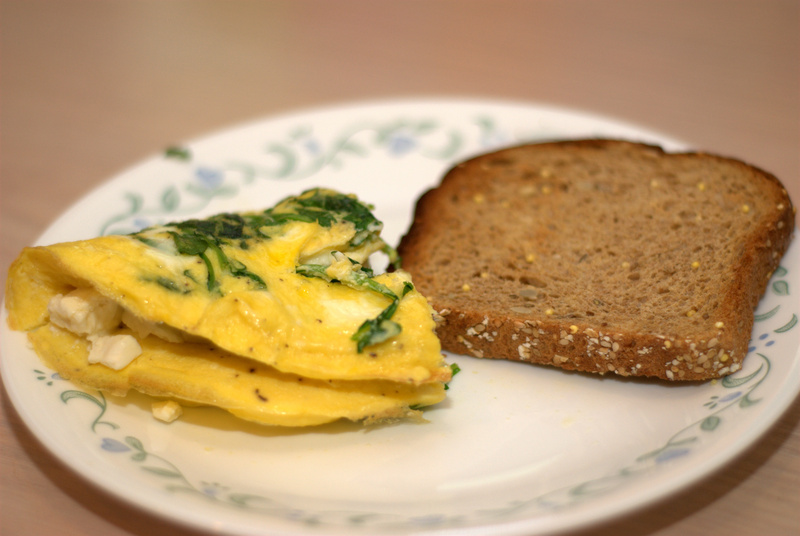 While the arugula is cooking beat the eggs with the salt, pepper and one tablespoon of water. 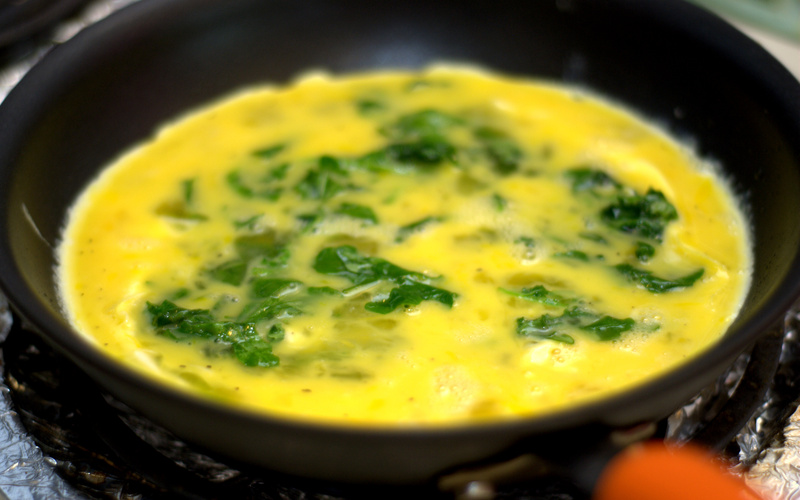 Once the arugula is wilted add the eggs to the pan. Lower the heat to medium-low. 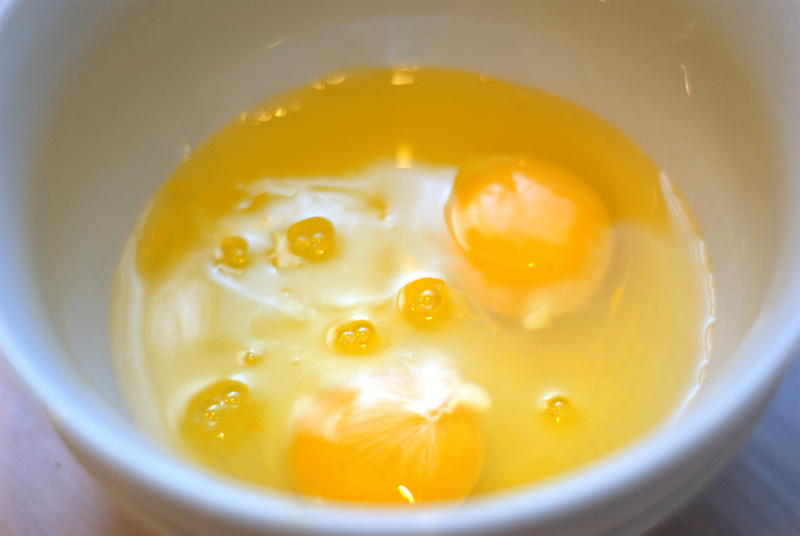 Cook the eggs until the edges start to firm up. 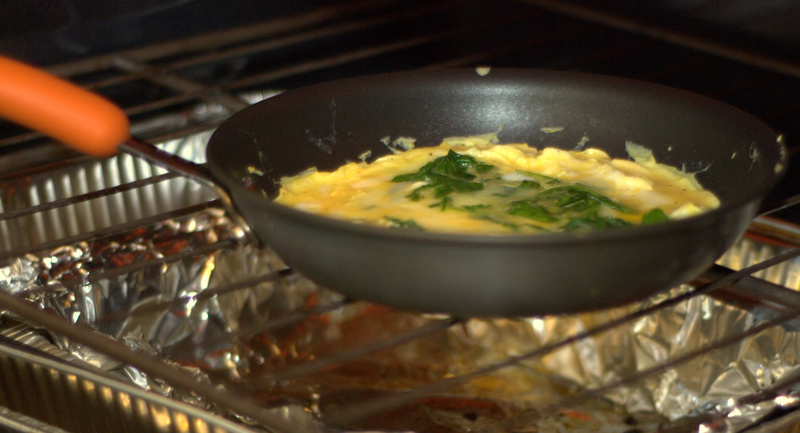 Loosen the edges of the eggs with a rubber spatula and tilt the skillet to let the uncooked egg run underneath. 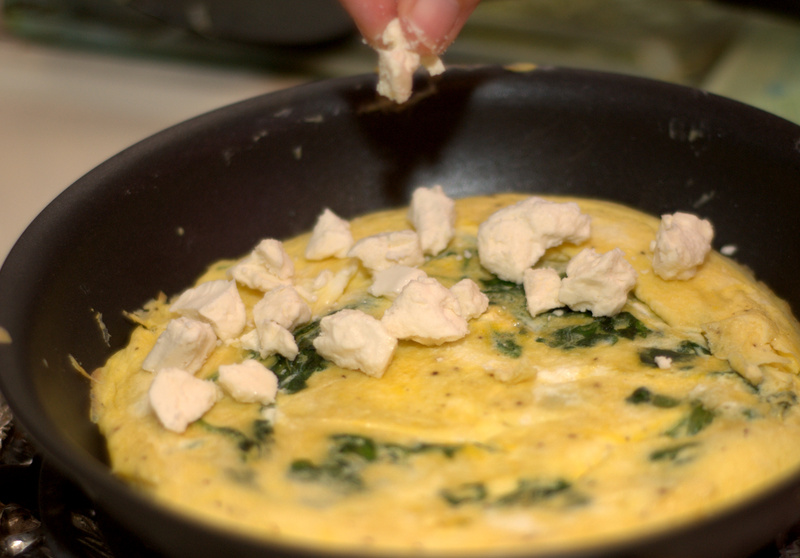 Once the bottom is firm carefully place the spatula under the egg and flip the omelet. If you do not think the egg will flip easily you can place the eggs under the broiler until the top is firm (about 3 to 5 minutes). This is my trick to perfect omelets every time! Sprinkle the feta crumbles onto half of the egg. Flip the egg on top of itself to fold in half. Cut the egg in half and serve. I love herbs and spices so much that I decided to write about them again. 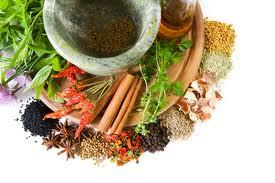 As I stated in my past posting herbs and spices important role in cooking. I personally know that my recipes would not be the same without them. I do stand by my statement that it is not always necessary to use fresh herbs. Yes, they are great, but also do not have as long of a shelf life like dried herbs. Fresh herbs can also burn or blacken easily which does not always make them ideal for grilling over an open flame or high heat cooking. I still do not advise switching out fresh herbs for dry in a recipe unless you adjust the measurements. Most of the time dried herbs have a more concentrated flavor than fresh herbs and not all dried herbs mimic the flavor of fresh herbs and vice versa. So, you have to be careful when making substitutions. Black Pepper – I am actually shocked that I left this off of my original list. You will probably see black pepper in almost every recipe that I make! I recently read that it is world’s most traded spice. I have also seen TV commercials that black pepper is a good source of antioxidants. I do not know if that is true, but it was on TV so it has to be right, right? 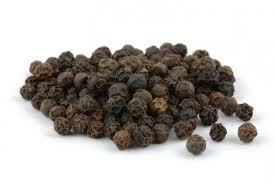 Peppercorns are a small and dried fruit. They can be used in cooking as the whole peppercorn or ground. I use both forms, but most often use the ground. I prefer to buy the whole peppercorns and place them in a pepper grinder so that I can grind it fresh when I need it. I love the subtle spice that it gives my recipes. I do warn you that if you use whole peppercorns be sure to fish them out of your food before serving. If you bite down on one it can be quite an experience! Cinnamon – This is another favorite. It has a warm and comforting taste and aroma (think apple pie). It is actually a spice obtained from the inner bark of the cinnamomum tree. 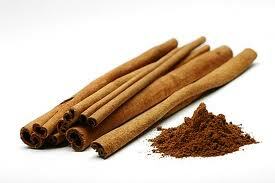 It can be found as a cinnamon stick or ground. Depending on what I am using it for will depend on the form I use. I love cinnamon in both savory and sweet dishes. I do not bake often, but use it in baking sweet dishes. I do love Indian and Middle Eastern food and use it often when making those types of cuisine. I love sprinkling a bit of cinnamon on top of a baked sweet potato or apple. I also use it as a topping on coffee and hot chocolate. Yum! Red Pepper Flakes (aka crushed red pepper) – I am totally my parent’s daughter in that I love spicy food. They go to restaurants and always ask for chilies with whatever they are getting. I am not to that extreme, but do like to spice things up in my cooking. My go to for that is red pepper flakes. They hit your tongue on a different spot than black pepper and have a sharper heat. 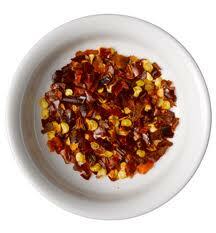 Red pepper flakes are made from various types of dried peppers. Used in moderation they can add spice to your dish without it being too overwhelming. Whenever I make a pasta sauce I always start out with some red pepper flakes, and it is a favorite topper on my pizza! 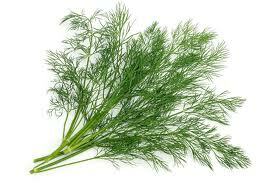 Dill – This herb has a very distinctive look and flavor. I love how the delicate fan of leaves looks. I also love how it tastes and smells. I find that people either love this herb or hate it. The aroma totally reminds me of chicken soup whether you are cooking it or not. It is a staple herb in my husband’s grandmother’s chicken soup. In addition to using it in soups and stews it is great with chicken, fish and in sauces. 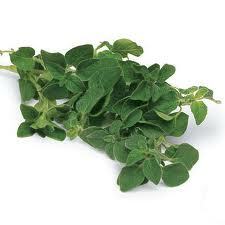 Oregano – I almost always associate this herb with Mediterranean food, specifically Italian and Greek food. Fresh oregano has a strong and almost floral taste. It is great in marinades, in sauces and with meat. It is one of the key herbs in my Lemon Herb Chicken. Dried oregano has a warm and almost earthy taste. I do not think it tastes much like its fresh form, but it can be in good spice rubs and also on top of pizza. There are a few things I like about this recipe. First is that it takes about five minutes to make, second it tastes great and third leftovers taste even better (if you have any that is). 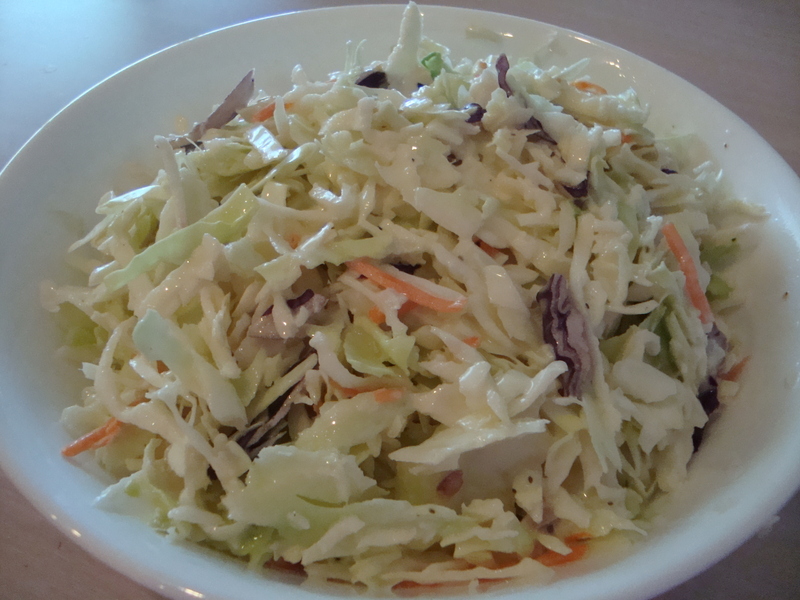 I never understood why people buy coleslaw from the supermarket when it is so easy to make. The supermarket version is normally loaded with mayonnaise and has little flavor. The big time saver on this recipe is the pre-shredded cabbage. Of course you can shred your own. However, I believe that time is money and I would rather spend a premium on the already shredded cabbage than take the time to shred it myself. It is really not much more costly to buy it done for you already. You can find a sack of cabbage for under two dollars. The other time saver is that there are only a few ingredients. I have seen several coleslaw recipes with a lot more ingredients than this. When you taste this recipe you will know that they are not needed. Whenever I make this, I get lots of compliments. If I serve it to guests they are very impressed that I made it from scratch. Little do they know how easy it is to make. If you are making this for a crowd you can easily make it the day before you serve it which is nice. My husband is a big fan of a New York style deli coleslaw and says mine is just as good as any deli he has ever been to. That is a pretty big compliment coming from him. This recipe is a flavorful side dish and does not have to just be made with burgers and hot dogs. On a week night when I need to get dinner on the table quickly I can whip this up in no time. I usually serve it as a side dish with different types of fish. Whether it be fish sticks, grilled fish or pan fried it goes great! It is also nice with grilled or barbeque chicken. 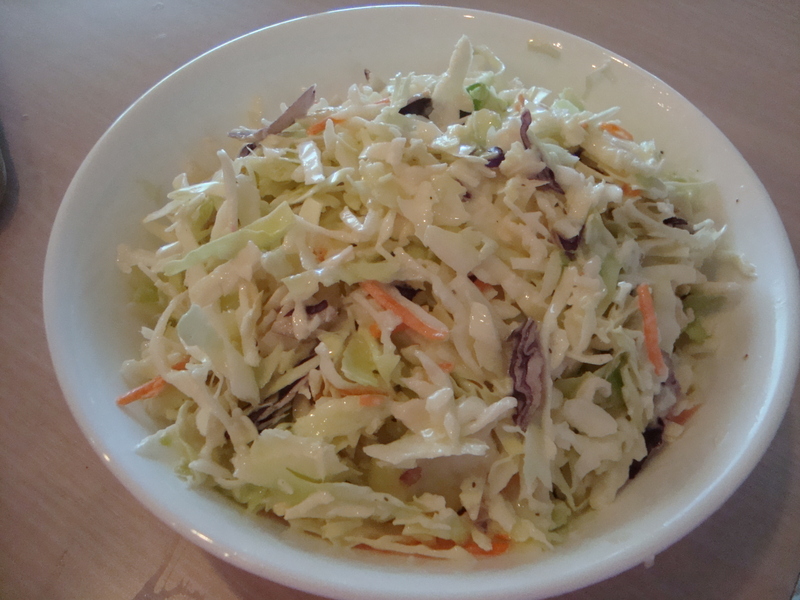 I do have other slaw recipes that I would love to share, but this one is a classic! Dissolve the sugar and salt into the vinegar in a large bowl. Add the mayonnaise, pepper and celery seed. Use either a whisk or fork to mix until there is a smooth dressing consistency. Fold in shredded cabbage and mix well so that every piece is covered in dressing. That is the question. We know that organic foods cost more. With the rising cost of food, is it worth it to shell out a premium for organic foods? I believe the answer is yes, sometimes. Buying all organic is a luxury not everyone can afford. I would hate for people to stop buying healthy fruits and vegetables just because they are more expensive. It is of my personal opinion that if you switch some key foods to organic you will be doing yourself, your family and the environment a huge favor. The benefit of organic produce to the environment means healthier soil that would sustain crops for years to come. There is a debate on whether or not organic foods are nutritionally superior. I think it is a trap to assume that just because something is organic that it is healthy. Fatty organic foods and snacks are still fatty foods! 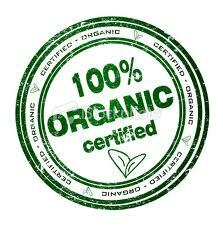 I think the real benefit from eating organic is to avoid ingesting pesticide residue on foods. Of course, the USDA does have allowable limits on the pesticide residue on foods, but there is concern that these limits are too liberal. For anyone who has seen the movie, Food Inc. you would have concerns too. I believe everyone can benefit from switching a few key items on their shopping list to organic. If you cannot remember exactly what items to buy organic, a good rule of thumb is to remember that tree fruits, berries, leafy greens and dairy products are the most important items to stick with for your organic shopping. Items with a thicker skin may not be as important. For the produce that I do not buy organic I always clean them really well with a wash made especially for cleansing produce. I would love to buy only locally grown, organic foods, but since that is not practical for me or my family here are my top ten items that I buy organic. Apples – They are among the most heavily sprayed tree fruits because of the threat of insects and fungus. Pesticide residue is also found in apple juice and apple sauce so I tend to buy all apple products organic. You can peel the apple to cut down on the exposure to the pesticides, but then you would be peeling away some of the healthy fiber and nutrients as well. 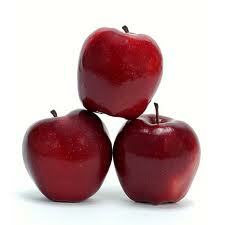 I find organic apples to have a much better taste and texture than non organic. They taste more like apples. I also cannot stand the waxy film they coat non-organic apples with any more. It never used to bother me, but now that I have switched I can never go back! Baby Food – I believe it is particularly important for young children and pregnant women to eat organic as children’s immune systems are not as developed as adults. They could potentially be more sensitive and have more adverse reactions to pesticides. So, why take a chance? Buy your babies and young children organic foods. I am not saying that you need to prepare all of their food from scratch. 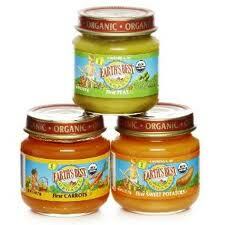 There are plenty of really good brands of organic baby food. One thing that I really like about the organic baby foods as opposed to the non organic is that there are less fillers in them. You just see the main ingredient and possibly ascorbic acid on the ingredient list of most organic baby foods. On the non organic foods I saw lots of fillers such as gelatin on the ingredient lists. Not necessary! 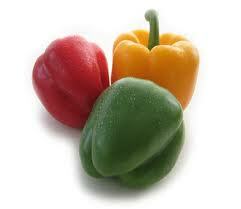 Bell Peppers – All colors of sweet bell peppers are on this list. They tend to be heavily sprayed and have a thin skin that can easily retain pesticide residue. You are not going to peel your bell peppers to get the skin off, so it is better to just buy them organic. 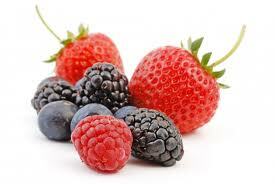 Berries – Berries are always on the list of the most heavily sprayed produce. The worst offender is probably strawberries, but I try to buy all of my berries organic. Their skin is so thin and permeable. The residue of pesticides can stay with the fruit no matter how well you wash them. Celery – This item used to not be on my list until recently. 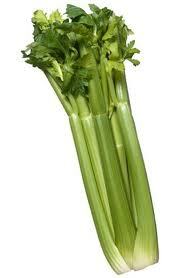 I found out that non organic celery has traces of over 60 pesticides on them! Now they are on my list. To make matters worse they do not have a protective skin on them at all. I also find the taste far superior in organic celery. The non organic variety can be almost tasteless at times. 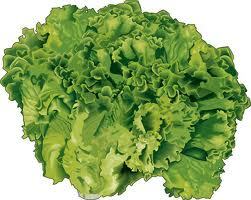 Leafy Greens – This includes all types of lettuce and spinach. Because their leaves are so tender they easily absorb pesticides. There is no protective skin on them either. The traces of over 50 types of pesticide residue can be found on the non organic varieties. 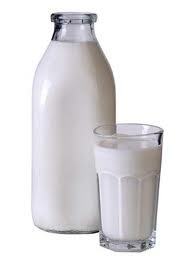 Milk – If you are only going to go with one item on this list, I would make it this one. It is great if you can buy all organic dairy products. If that is not practical then definitely at least stick to milk. 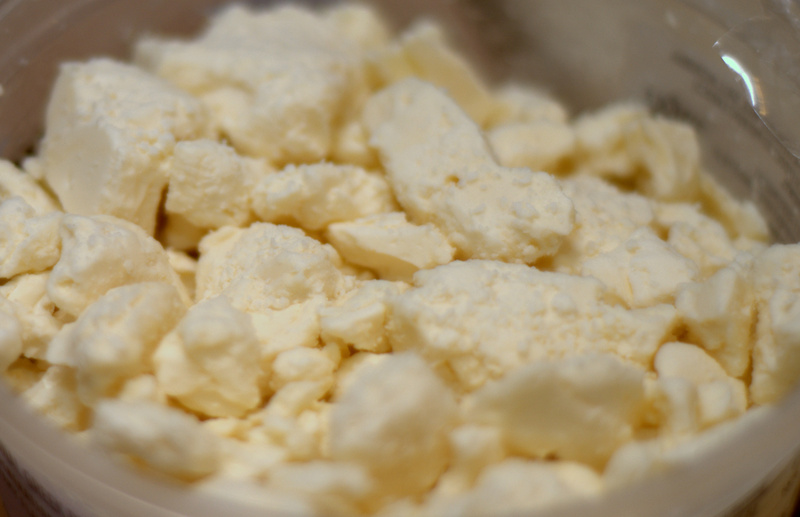 Organic milk lacks the traces of antibiotics, pesticides and hormones of non organic milk. It is of particular concern because it is such a staple in kids diets. Peaches – They fall in the category of tree fruits. 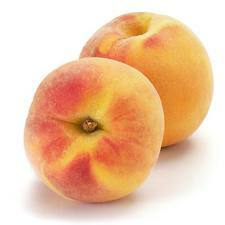 They are heavily sprayed and over 60 types of pesticide residue can be found on a single pack of peaches. I add nectarines to this list as well since they are so similar and farmed together often. Peanut Butter – They are on my list for two reasons. First, peanuts are the most heavily sprayed nut with pesticides. Second, this is a staple of many kids diets. There is a debate as to whether or not the dreaded peanut allergy comes from the pesticides used on peanuts. I cannot comment on that, but think it is best to go with organic just in case. 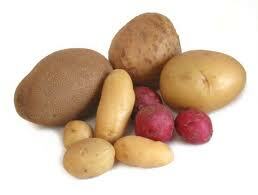 Potatoes – More than 35 pesticides have been detected on potatoes. Even if you peel the potato pesticide residue can still be found on it. They also make my list because they are a staple on most American dinner tables. Anyone craving some healthy food after the Easter and Passover holidays? I personally ate waaaaaaaay too much. I enjoyed some really good food which was nice, but I think I also gained five pounds which is not so nice! Whenever I am feeling like I need to reign in my calorie intake I turn to salads. They are filling and packed with healthy veggies and proteins. I have dozens and dozens of terrific salad recipes that I would love to share. This is one of my all time favorites. It is colorful, filling and full of flavor. It is perfect as a main course salad for lunch or dinner. Combine garlic, juice of one lime, 1 tablespoon olive oil, 2 tablespoons of chopped cilantro in a bowl. Add ½ teaspoon salt and cracked pepper. Mix well and add chicken. Marinate 5 to 10 minutes. Heat a grill pan over medium heat and place chicken on the grill. Cook the chicken until done – about seven minutes each side depending on thickness. Be sure chicken is cooked through and the juices run clear when you cut into it. Allow to cool for 5 minutes and then slice the chicken on the diagonal to make chicken strips. While the chicken is cooking combine the juice of 1 juicy lime, the zest of half the lime, 2 tablespoons cilantro, 1 teaspoon of honey, ½ teaspoon of salt and a few grinds of pepper. Whisk in 2 tablespoons of olive oil. Spray the tortillas with olive oil (or brush lightly) and sprinkle with salt. Add to grill pan and cook until crispy on both sides, turning once. Cut into 4 wedges per tortilla. While tortillas are cooking, arrange lettuce on a large platter. Add the tomatoes, scallions and sprinkle the beans and corn on the salad. 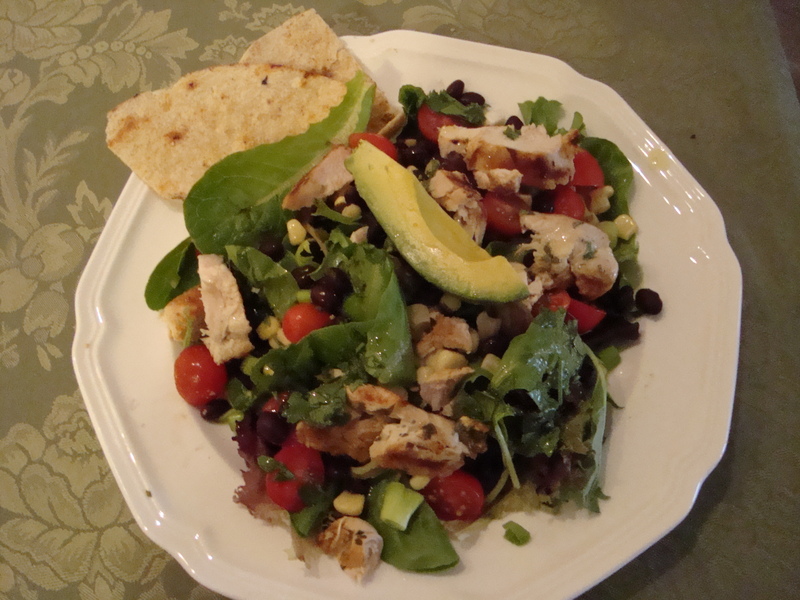 Add the chicken and top with avocado, tortilla wedges and dressing. Very pretty presentation! Food is my passion. In addition to loving to cook, I also love to learn all about food. I am interested in where it comes from, its nutritional value, the best foods to eat, the worst foods to eat, how food is processed in your body, etc. I read books about food (not just cookbooks) and I watch movies about food. I have seen a few documentaries about food related topics and they have been very informative and interesting. Food Inc. is probably the most powerful movie about food that I have ever seen. I must give a disclaimer – this movie is not for the faint of heart. You do see animals being slaughtered as a food source. It is very graphic. If you think this may be an issue for you please do not watch this movie. 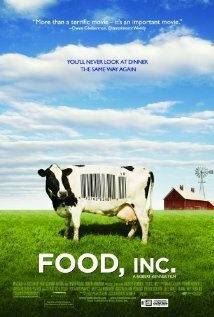 That being said, if you can get through those scenes this movie provides an eye opening look at America’s food industry. It highlights the corporate controlled food chain that is blessed by the USDA and FDA, the very entities that are supposed to police our food supply. There are some great interviews with food experts and refreshing interviews with some forward thinking people of the industry. In addition to the interviews, you go behind the scenes of the American chicken, beef and pork industry. This is where things get ugly (literally). I admit to having a hard time eating meat after watching this movie. I have a friend who stopped eating meat all together after watching it. Not only does the movie highlight the meat industry it also takes a look at the agriculture produced in the U.S of A and the lengths food producers go to in order to lengthen the shelf life of fruits and vegetables. Harmful E.coli and listeria bacterias are on the rise with tens of thousands of people getting sick or dying from these strains every year. There is also our environment to think about and the sustainability of our food sources. This movie draws attention to all of these topics in a very insightful manner. I am by no means advocating becoming a vegetarian or buying only organic products. However, I do believe that it is important to know where your food comes from so that you can make informed decisions on the products you buy, such as buying select organic ingredients or free-range grass fed meats. This is the food we feed ourselves and give to our children. Knowledge is power and having the public further scrutinize our food industry cannot be a bad thing. This is a great Passover dish because you can easily substitute the bread crumbs for matzo meal. The recipe can easily be doubled or tripled for a lot of guests. Even if you are making this for two or three people I suggest making the whole batch as leftovers are delicious! Coat a heavy bottomed, medium sized pot with cooking spray (or oil in a Mist0) and sauté the onion over medium heat until softened, about 3-5 minutes. Add the rest of the sauce ingredients and stir until the tomato paste and grape jelly are completely melted into the sauce. Season with salt and freshly cracked pepper to taste. Bring sauce to boil and reduce to simmer. Mix meatball ingredients in a large bowl until just mixed through. Roll meat into balls and add to sauce. 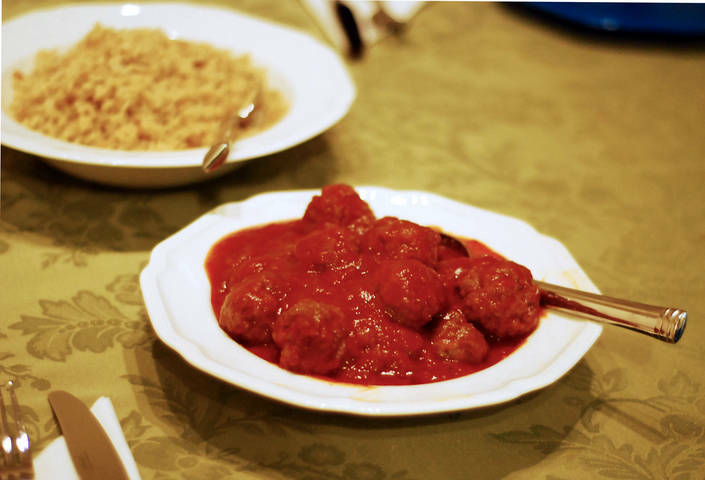 Bring meatballs and sauce to a low simmer and cook 45 minutes, covered shaking the pot often to prevent sticking.